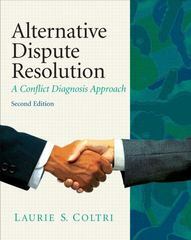 Alternative Dispute Resolution 2 Edition Now in paperback, this book addresses the rapidly evolving field of Alternative Dispute Resolution in a manner ahead of its time. Taking a cross-disciplinary approach, it explains the cognitive, social, organizational and developmental psychology theories that influence ADR and its approaches. From mediation to arbitration to hybrid processes, it helps students understand the strengths and weaknesses of the many varieties of ADR, and why various approaches succeed or fail. This edition includes streamlined coverage of conflict diagnosis, increased treatment of non-adversarial, facilitative forms of dispute resolution, and the latest legal and ethical trends impacting the field.